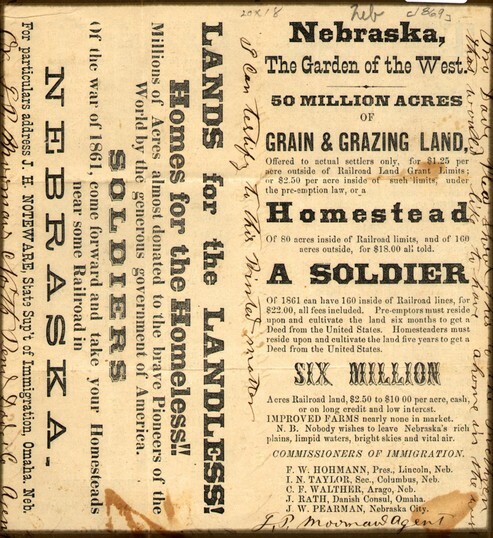 1869 advertisement encouraging easterners to claim "lands for the landless" in Nebraska. The Pioneers Summary of migration reasons, provided following a timeline, from Lone Hand Western. Manifest Destiny Reasons for the American zeal for westward expansion from PBS's "The United States-Mexican War." The Erie Canal Relation of the Erie Canal to western migration from New York State Canals. Western Expansion Overview of western migration that includes a characterization of the "pioneer spirit" that inspired it from American West.com. The Garden of the World Relation of American faith in farming to western movement in Henry Smith's "Virgin Land: The American West as Symbol and Myth" from The University of Virginia. The Middle West Analysis of Northern migration surpassing the initially predominant Southern migration in Frederick Jackson Turner's "The Frontier in American History" from The University of Virginia. Western Migration Highlights Timeline of nineteenth century western migration that includes some causes from The Utah K-12 Education Project. Masculine Empire or Domestic? Contrasts of the motivations/professions of western settlers after the Homestead Act from Woolongong University. Joseph Smith Biography of the founder of the Mormon religion, including explanations of why the Mormons migrated from settlement to settlement from PBS's "New Perspectives on the West."